Mood board: Filmy, feminine and with a touch of the East, Giorgio Armani closed Milan fashion week with a collection that touched upon his favourite fashion oeuvres. The soft mood could be seen in the bank of Water Lilies crafted from plastic LED lights that lined the runway and onto the clothes where transparency, flirty short hems and classic men’s jackets took centre stage. Best in show: While there was plenty of painted chinoiserie and signature flippy little skirt suits, we loved Armani’s move into new silhouettes. One dynamite example was a long sleeved, full-length pink silk dress with a fitted waist and prim round neck that had been covered in a lily print. Also noteworthy the finale of sequin two pieces such as a red dot patterned navy jacket worn over a red, while and blue tulle mini dress. 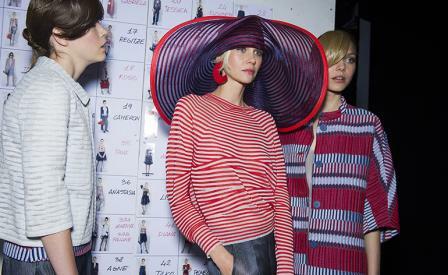 Finishing touches: Half of Armani’s accessories live in funky town (like striped oversized hats), but there were a few cool, modern options such as flat espadrilles with red white and blue woven uppers that looked terrific.